Friday evening presented a somewhat different spectacle. For a start, it was bitter. Unwisely I was wearing elements of my Autumn Collection rather than the upcoming Deep Winter/Brass Monkey ensemble. To add to the misery my neighbour arrived late. As he’s a former prop and adds a substantial windbreak his presence was sorely missed until he pitched up on 20 minutes. To add insult to injury, Bernie declined to high-five me as I made my way to my seat. Mascots these days. First things first. Despite the appalling conditions and commentary elsewhere, this was a decent game, although time did hang heavy in parts of the second half. Both sides made an effort, albeit only in patches from Gloucester. They started the better, helped by the Saints making a right Horlicks of the kick-off. I can’t see that the wind played a big role in this, we simply got it wrong. It didn’t augur well for the rest of the game. For the first five minutes Gloucester had the upper hand, trying to link some moves together but the Saints defence held strong and began to exert some control. We were then “treated” to a kicking duel, if that’s the right word, something which understandably broke out at various stages of the match. Although Saints dominated possession for the next 20 minutes, we lacked imagination in the backs and a certain zip, even allowing for a downpour that threatened to flood the ground. Kahn also seemed to be struggling with his passing, lacking pace when quick hands might have got things moving. One exception was a run by George North where he chipped ahead, no doubt to the joy of the Gloucester full back Cook, who looked like he was about to be steamrollered. An image of Wile E Coyote ground two feet into the earth sprang to my mind as the collision approached. North had a decent evening all round, doubly so given the conditions. For the gentlemen who keeps writing “what are we paying North for” on the Saints website, this was your answer. The Saints pack did what they do best in the loose and turned the screw on Gloucester from the first scrum. My notes on the match seem to read scrum-penalty from the first to last whistle. Indeed I find it hard to recall a Saints scrum that didn’t result in a penalty in our favour. On this evidence the Saints, even lacking Hartley and Corbisiero, must have two of the best complete front rows in the Premiership. Myler, who sounded hypothermic in his post match interview, kicked three penalties in the first twenty minutes and Gloucester were forced into a front row change to stop the bleeding. The next event of note was the appearance of a “lady” dressed as a nurse who made tour of the ground to some applause, not least for “his” bravery in wearing next to nothing in the Arctic conditions. I’m assuming it was his stag-do, although given his outfit was cherry and white he might have been next in line for the Gloucester front row. Couldn’t have done any worse. Twelvetrees then kicked what turned out to be his only penalty of the night. To be fair to Gloucester the one area of the game where they found their Mojo was the rolling maul, causing the Saints problems for most of the game. Following one such drive Tom Wood, skipper for the evening, was carded. Given my ideal refereeing position high in the Tetley’s stand through the driving rain it looked harsh. What is perhaps of more note is that Mr Garner, who had a good evening in general and was ably supported by a touch judge who showed more sense of humour than normal, failed to take action following repeated scrum infringements. Down to fourteen did create concern that Saints had failed to make hay whilst the sun shone (never has the phrase been more inappropriate), but Twelvetrees missed the kick at goal and we went to half-time at 9-3. A further highlight was an astonishing piece of quick thinking by Ace, taking a flying mark right on the touchline to kill off a promising attack. The rain stopped in time for the second half kick-off although the cold did not. Tom Wood returned to the fray and Saints began to string some moves together. Ace, Luther and Myler all managed breaks but the ball failed to go to hand. Dickson came on and brought some spark with his passing, including one fired into Moriarty who was lurking offside. Another Saints break from a lineout looked to go all the way but Alex Waller knocked on close to the line. In a flash the ball was worked to Johnny May who screamed down the touchline showing excellent pace. Ben Foden, who again excelled all match, hared across to close him down, May kicked ahead and the move was over. Personally I’d have put money on May scoring when he got to halfway such was his speed, which again must add fire to the “Foden for England” campaign. Gloucester continued to maul well but their plans to bombard the Saints with Garry Owens fell flat as several kicks blew back over their heads. At 58 minutes by my watch a man bearing a resemblance to a hairy Table Mountain entered the field for his Saints debut. Welcome on board, Mr Matfield, we’ve been expecting you. A nice touch was the Saints head guard and he made an immediate impact, giving some major oomph to a couple of mauls and winning a penalty. J J Hanrahan also showed well, combining beautifully with Ace but the move was killed. 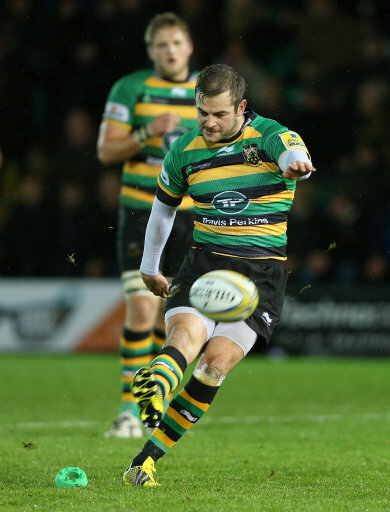 Myler kicked the penalty and repeated the dose on 70 minutes. Gloucester continued to try and Saints were lucky to escape from a Twelvetrees chip through that hit the post and caused an early bout of Pantomime slapstick to break out in the in-goal area. Gloucester finally lost a man to the bin and Myler missed his final kick at goal, understandably in the conditions. Saints crossed the line in the dying seconds, but the try was denied for a knock-on. I’m off to Bath next Saturday for my annual away trip and I go with renewed faith in our ability to get a result. If you didn’t see this game and read the media reports, don’t be fooled that this was a 1970’s mudfest. The Saints showed some real flashes of skill and in better conditions some of the moves would have gone to hand. The pack, despite missing Clark, Lawes, Hartley and Corbisiero handed Gloucester a lesson in controlled malevolence and Mikey Haywood was justifiably Man of the Match. Onwards and Upwards! Heartfelt thanks for an excellent report, Will. A thoroughly enjoyable read. Cheers. William - thank you for an entertaining introduction and accurate assessment of the match. From the comfort of my sofa I thought that it was a creditable performance, particularly as the Gloucester pack have been doing well this season. You need to speak to the Club about the snub from Bernie - perhaps he wasn't aware of your importance as scribe for the game? As for your neighbour you should be aware that props are often slow in getting to the mark, perhaps a back row forward would be better choice - the speed of arrival may offset the lack of ballast? Excellent report. In retrospect it was interesting that both a very rapid winger and a very physical one chose to kick and chase rather than take on the defence. Lovely bit a bout the benefits of a prop windbreak. A splendid report... as someone who was also in the Tetley's, I can vouch for the reporting on the conditions! A good read - thank you! Lovely report Mr Morris, almost as good as your wallpaper designs.